Lil Uzi Vert's retirement has been called off, for now. Lil Uzi Vert has drawn the short end of the straw, where career drama is concerned. Despite having one of 2017's most successful singles, Lil Uzi has been on somewhat of a forcefully-imposed hiatus. Though responsibility is difficult to dole out, Uzi has pointed the finger at both DJ Drama and Don Cannon, who have since claimed they're doing little in the way of meddling. Despite the muddy circumstances, which recently found Roc Nation sliding through to stage an intervention, Uzi's Eternal Atake remains in a purgatorial state. And yet, Lil Uzi has chosen to look at the glass half-full. Taking to Instagram to declare his message of optimism, Lil Uzi asserted his mental fortitude amid trials and tribulations. "For everybody that thought I was done and thought they was gonna end my career," he writes, in his Instagram story. 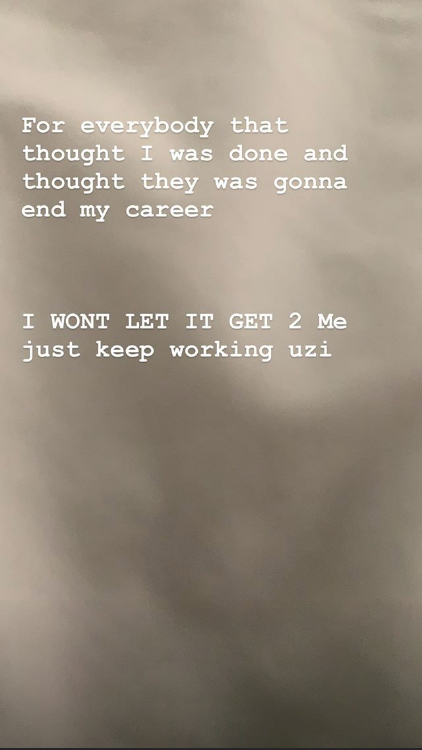 "I WONT LET IT GET 2 ME just keep working uzi." At this moment, it's unclear what Uzi's ultimate fate will be. At this point, the delays are verging on farcical, and while "Free Uzi" briefly acted as a lightning rod of sorts, the single was summarily pulled from all official streaming services. At this point, whether it be contract renegotiations or heated exchanges of hearsay, Lil Uzi Vert's place in the game will remain a question mark. We can only hope his newfound positivity remains, as there's no telling what lies ahead for the young talent. Toni Braxton Denies Birdman Breakup Rumors: "We Don't Know What Happened"